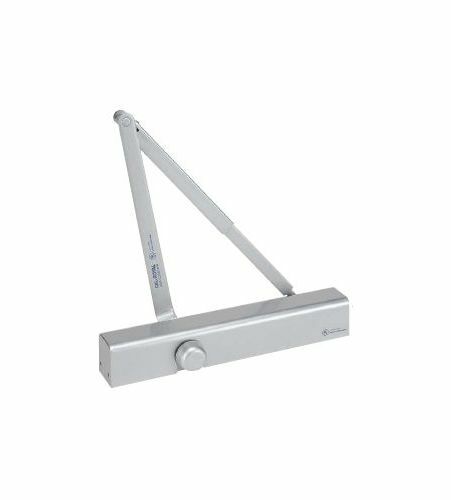 CR801 Series Grade 1 Barrier Free Adjustable Door Closer with Slim Cover. The CR801 Series Door Closer is part of Cal-Royal s finest Grade 1 door closers. The CR801. S is a heavy duty double lever with extra smooth action and includes a slim line door closer body cover. With features such as non-handed universal installation, adjustable closing and latch speed and adjustable back-check, the heavy duty commercial door closer is well suited for office building, shopping centers and other commercial buildings. Heavy Duty Double Lever Arm. Slim Line Plastic Cover Included. Optional Cushion Stop Arm Available: Item # SPAS/900. Optional Hold Open Cushion Arm Available: Item # HOSRPS/900. Optional Spring Cushion Arm Available: Item # 900. Closer Body Length: 12-3/4" Horizontal Mounting Holes: 12" Vertical Mounting Holes: 3/4" Closer Body Width: 1-1/4" Closer Body Projection from Door: 2-1/8" Cal-Royal has focused on providing " Innovative and Value Added" hardware products and accessories to the builders industry since 1983. In accepting this charter, Cal-Royal has continued to be the leader in import hardware. Their product offering is designed to comply with the Americans with Disabilities Act (ADA) and to encompass all levels of ANSI classification, Grades 1, 2 and 3 as well as UL requirements. They offer a complete line of mortise locks, exit devices, door closers, hinges and many other hardware and trim products.